At Vinny & Son Contracting Corporation, we pride ourselves on providing our clients with professional brick paving designs and installations throughout the greater region of Queens, NY. Within the team we have a combined 30 plus years of experience in the hardscaping industry. What this means is that we have all the knowledge and the expertise needed to create a brick feature for your residential or commercial property. 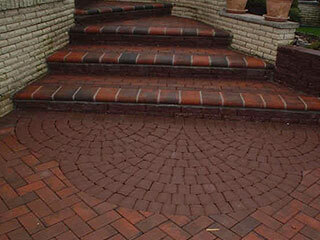 When it comes to brick pavers there is no wonder that it one of the most popular materials on the market nowadays. Brick has so many great characteristics and benefits that it is hard to compare to another type of paver material. Couple that fact with our premium installation services; you’re on to a winner! So, you want to pave a new driveway, walkway, pool deck, sidewalk or patio? And you are trying to decide on which type of material to choose? Let us talk about the advantages of using brick pavers. Man Made Product: one of the great things about choosing to use a man made product such as brick is that it is readily available. It is a manufactured product and therefore you will be able to source as much or as little of it as you need. It is not like natural stone which can be hard to source and at times may have limited supplies. Affordable: because it is a manufactured product it is also affordable. You will be able to find many suppliers of brick pavers and all at a reasonable price. So this is great news of you will be taking on a large paving job! Durable: brick is a very durable building product and that is why it has been so widely used for so long. When brick is made it is fired in kilns at extremely high temperatures. This is part of the production process and this makes brick perfect for all types of weather conditions; making it an ideal building material for use outdoors! Aesthetic Appeal: brick has come a long way over the last few decades. There are so many more options nowadays in terms of color, size, shape and texture. There is a high demand for brick pavers that have all the functional qualities but will also increase the aesthetic appeal of any property. Complements House Bricks: if you have a brick house and you are thinking of using brick pavers for your next hardscape project then you will be able to find a brick paver that complements the brick that is used for your homes façade. Versatile: as we have mentioned here, brick pavers are so versatile that they can be used for a wide range of outdoor applications including patios, driveways, retaining walls, water features, fireplaces, outdoor kitchens, walkways, pool decks and so much more! Don’t hesitate to contact the team at Vinny & Son Contracting Corporation today and we will arrange for a free consultation on your next brick pavers project in Queens, NY!